Canada is the fifth-largest producer of asbestos, a controversial mineral that is banned in many developed countries. Asbestos wasn't always a dirty word. The needle-like fibre had many uses and inventors were tripping over each other to find more: it was woven into clothes, building insulation and coffee pots. It was even mixed with children's play dough and, at one point, had roughly 4,000 other applications. But in the 1960s and '70s, when a growing number of asbestos miners started showing signs of respiratory diseases, the sheen wore off. As a result, Canada has spent the last 25-plus years trying to rid our homes, schools and offices — including Parliament Hill — of the dangerous dust that was often loosely sprayed as insulation. However, the country continues to mine and export the controversial mineral — though only chrysotile, or white asbestos, which the government says is safe to use. This has drawn international and domestic condemnation from health and labour groups who say the material is causing tens of thousands of deaths, primarily in the developing world. Adding to their argument, in February 2012, an Italian court convicted two construction company executives of criminal negligence for failing to take preventative measures at factories where asbestos had been used and which resulted in the asbestos-related deaths of over 2,000 workers. The two men were sentenced to 16 years in prison and were appealing. Asbestos was first mined in Quebec in the 1870s. In the mineral's heyday, Canada boasted the world's biggest open pit mine, the Jeffrey Mine located in the province's Eastern Townships. The industry thrived and a town was even named after it, Asbestos, Que. "These enormous asbestos deposits in the province of Quebec are immensely valuable to Canada in war and peace, and they form a very important part of our great heritage of mineral wealth," said CBC Radio's Lorne Greene in 1942, on-site at the Jeffrey Mine in Asbestos, Que. But by the late 1960s, things started to change. Asbestos, Que., named after the once-thriving local mining industry, became a target of the American satirical news program, The Daily Show with Jon Stewart, on May 2011. A comedic segment produced by one of the show's reporters, Aasif Mandvi, poked fun at the town for promoting the mineral that has been linked to cancer and lung disease. During the five-minute sequence, Bernard Coulombe, president of the Jeffrey Mine, said its product, chrysotile, also known as white asbestos, was "relatively" safe. Coulombe denounced the segment a few days later, saying it was in poor taste and that he didn't know it was a parody until it was too late. He also insisted that chrysotile has been proven safe. An increasing number of miners had shortness of breath, extreme fatigue and were coughing up blood. Studies linking asbestos to voracious diseases such as lung cancer, scarred lungs (asbestosis), and mesothelioma (cancer of the stomach and chest, which is only caused by exposure to asbestos) began to rack up. One of the very things that made asbestos so popular — its indestructibility — was what also made it so vicious. Once a person inhaled the deadly dust, it was impossible for the body to break the fibres down and it eventually led to severe scarring and death. In the fall of 1974, Dr. Irving J. Selikoff, the world's foremost authority on asbestos-related diseases, and a team of doctors examined the workers at Thetford Mines in Quebec. He condemned the working conditions as the worst on the continent, further cementing asbestos' notorious legacy. The sentiment spread to Baie Verte, Nfld., in 1978. Miners walked off the job and demanded protections to reduce their exposure to the deadly asbestos dust. The 15-week strike was the longest health-related strike in Canadian history, and caught the nation's attention. In the 1980s, the asbestos industry in Quebec tried to mend its crumbling image and salvage its shrivelling industry. The province was quickly becoming the centre of the controversy and many of the mines' customers began phasing out the mineral from their products. The industry, backed by the Canadian government, spent millions on research and to fight bans on the product at home and abroad. In 1984, Ottawa established The Asbestos Institute — now called The Chrysotile Institute — to promote the safe use of white asbestos. But in 1989, the industry was dealt a hefty blow: the U.S. announced plans to ban asbestos because of the health risks. While Canada's neighbours to the south weren't big importers of the mineral, the asbestos industry feared the move would have a domino effect worldwide. However, the U.S. didn't completely ban the use of asbestos though the market is relatively small today. The country imported only 820 tons in 2010, according to estimates released by the U.S. Geological Survey. Most developed countries, including Japan, Australia and all of the European Union, have banned the substance. The same cannot be said of many developing countries, including India, Brazil and Kazakhstan, which continue to import large amounts of the material. China, by far the world's leading asbestos consumer, used more than 600,000 tonnes in 2007, according to the U.S. Geological Survey. Canada continues to be a proponent of the controlled use of white asbestos. Ottawa argues that chrysotile is different than the type (amphibole) that has wreaked so much havoc. "Most of these health hazards come from the past use of amphibole asbestos and from inappropriate practices such as sprayed-on insulation. These practices have been discontinued in Canada since the 1970s," the Ministry of Natural Resources says on its website. Chrysotile is less crumbly and is used for things like cement, a solid that is less likely to release the deadly fibres into the atmosphere, says the Chrysotile Institute, the government-funded organization that promotes the use of the mineral worldwide. The institute says the industry has learned from previous problems and has strict controls in place at the plants. Provincial governments now regulate the use and handling of asbestos on job sites. Canada mined 150,000 tonnes of the mineral in 2009, according to data from the U.S. Geological Survey; a significant drop from the 714,000 tonnes produced in 1989. All of the country's deposits are found in a 100-kilometre-long stretch of land in southeastern Quebec between the towns of Asbestos and East Broughton. More than 90 per cent is exported to some 60 countries, primarily in Asia, Africa and Latin American, according to the Ministry of Natural Resources. 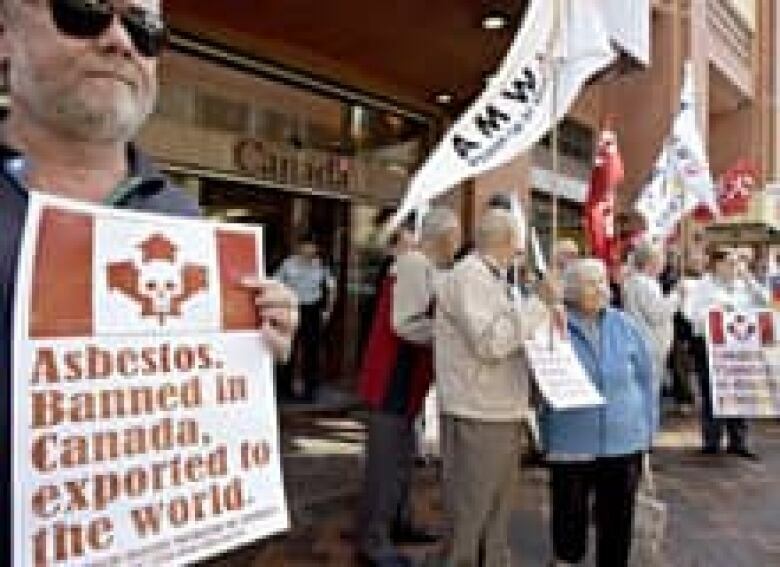 Canada ranks fifth in terms of global asbestos production, behind China, Brazil, Kazakhstan and Russia — which is the world's leader, mining 1,000,000 tonnes in 2009. The industry continues to face criticism from health and labour officials both here in Canada and abroad. The World Health Organization has labelled all types of asbestos, including chrysotile, as carcinogenic. According to WHO statistics, 125 million people are exposed to asbestos in the workplace around the world and more than 107,000 die each year from related illnesses. In December 2010, the British medical journal The Lancet published an article critical of the continuing production and export of asbestos in this country. While Canada continues to pull the mineral out of its own buildings, the article entitled "Canada accused of hypocrisy over asbestos exports" noted, it still sends the product to less wealthy countries. Critics say safety requirements — including respirators and protective cothing — are less stringent in many developing countries. An investigation by the CBC's Melissa Fung in June 2009, revealed that many workers in India wear little more than bandanas when handling asbestos — sometimes nothing at all. On Feb. 15, 2011, the Canadian Cancer Society, along with 25 other health organizations, urged the federal government to stop funding the Chrysotile Institute and to halt exports to developing countries. However, Canadian production of asbestos might actually increase in the coming years. On April 13, the Quebec government gave conditional support to a project that would revive one of Canada's last-remaining asbestos mines — the Jeffrey Mine. A consortium of investors asked the province to guarantee a $58-million bank loan that would be used to convert the open-pit mine to an underground operation and increase production ten-fold - to 180,000 tonnes by 2012.